The Cast: Nathan Lee Graham, Rema Webb, Shayna Small, Ken Robinson, and Capathia Jenkins with percussionist Akili Jamal Haynes; The Creative Crew: Clint Ramos (Scenic Design), Anita Yavich (Costume Design), Driscoll Otto (Lighting Design), John Shivers & Kevin Kennedy (Sound Design) & Zachary G. Borovay (Projection Design). In one act with no intermission. In the climate of recent racist-charged events in Ferguson, MO, Staten Island, NY and at University of Oklahoma to name just a few, even though written almost 30 years ago, The Colored Museum poignantly states that we as a society and nation still have a long way to go in terms of racism. Taking no prisoners and using humor to confront the conflicts, mistakes and prejudices of mainstream America, Playwright George C. Wolfe uses strong satire to provocatively teach and to make us laugh, often thoughtfully at ourselves. 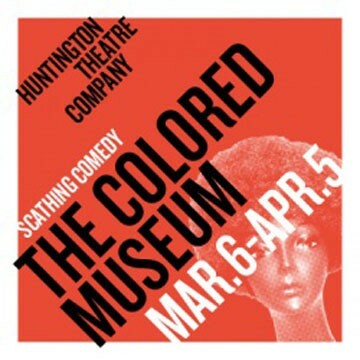 Certainly sparing no one, initially off Broadway in 1986, The Colored Museum stunningly confronts audiences by wit, satire and irony. The show is Black History as lessons in Pop Culture, human foibles, white insensitivity and survival. This living museum contains 11 sketches as “exhibits" that are actually displays about being Black in America in a contemporary and historical context. The Colored Museum is a richly seasoned theatrical feast that makes us taste of the sweet as well as the sour of the American Black experience. Though at times a bit uneven, overall this show is an extremely clever, incisive perspective on the complexities of race, racism and the challenges of African-American identity. Gifted Director Billy Porter, a Tony Award winner himself, craftily directs often infusing and combining comedy with pathos. In his deft hands, our laughter is sometimes tempered by moments of stark realization and sudden sadness. He strategically orchestrates/choreographs the versatile, appealing and talented cast in a variety of roles and settings. Standout performances are given by the entire ensemble, but at times Capathia Jenkins, Ken Robinson and Shayna Small are just remarkable. Each role that they play expresses a vivid characterization. And all of their voices are impressive as well. Percussionist Akili Jamal Haynes punctuates the performances. The stagecraft as usual at The Huntington is exemplary. Clint Ramos' scenic design using rotating sets is spectacular. Anita Yavich's costumes seem just right and often spectacular, while Driscoll Otto's lighting adds drama and energy to the entire production. 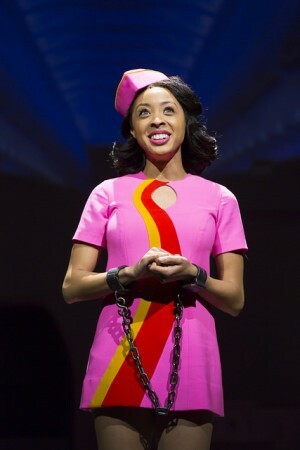 Starting with the first exhibit, “Git on Board,’’ where a pink-clad airline stewardess, brilliantly played by Shayna Small, presides over a “Celebrity Slaveship,’’ we are humorously and ominously involved in a contemporarized slave journey to Savannah, a slave market, from the Ivory Coast. After instructing the passengers to fasten their manacles and shackles as if they were seatbelts, the stewardess pertly says straightforwardly, "There will no drum-playing," and "We ask that you please refrain from call-and-response singing between cabins, as that sort of thing can lead to rebellion." Her overly cheery voice adds to the creepiness of the miserable aspects of history. 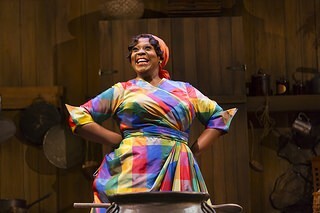 Capathia Jenkins is marvelous as Mammy Aunt Ethel hosting a cooking show. Her rendition of the recipe on how to “bake yourself a batch of Negros” is a showstopper. 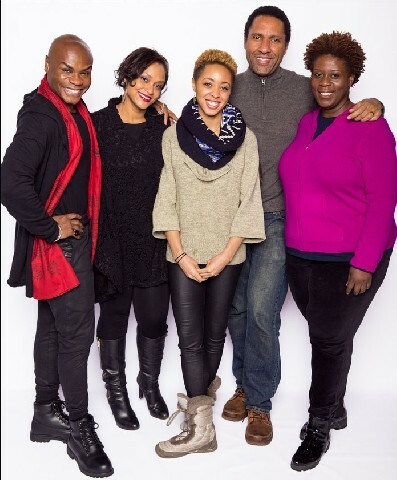 "The Photo Session" makes fun of the overly glamorous Black couple (Nathan Lee Graham and Rema Webb) wearing both the best of everything and perfect smiles. This suggests the fantasy of the superficial world of narcissistic glamour of Ebony Magazine has nothing to do with the extremely tough and often gritty real world. Several exhibits have real power. “A Soldier with a Secret’’ shows how a deranged black soldiers (Ken Robinson) faced the challenges on the homefront as well as the battlefield, and what a hero means and meant. Using the issues of wigs and hairstyles, “The Hairpiece’’ reflects on Black identity struggles. In “Symbiosis,’’ a well dressed, professional Black man (Ken Robinson) tries to literally throw away his past. This includes his first sneakers-- Converse AllStars, his first dashiki, his first Afro comb, his copy of Eldridge Cleaver’s “Soul on Ice’’ and his beloved soul and R&B music. His confrontation with his younger, hoodie-wearing self makes him wrestle with his soul. Poignantly in the end, Ken Robinson beautifully sings the Temptations' "My Girl"'s first stanza "I've got sunshine on a cloudy day..."
Less successful are “Lala’s Opening,’’ "The Gospel According to Miss Roj" and "Permutations." They are overlong sketches that seem to try too hard with less power and far less meaningful punch than many of the others. The diva, transgendered and egg metaphors get lost. However, perhaps the most layered "exhibit" is The Last Mama-on-the-Couch Play. Set up by a “Masterpiece Theater”-type announcer, this exhibit explores and satirizes formulaic Black drama too often used in theater and film. Include a “well worn” mama on her “well worn” couch who fights with her overwrought son Walter-Lee-Beau-Willie-Jones whose furrowed “brow is heavy from three hundred years of oppression.” It is Playwright Wolfe’s parody of Raisin in the Sun, andit goes from overacted comedic melodrama to an all Black Broadway musical number and takes us from smiles and laughs to feelings of regret and remorse. Wonderful to watch and hear, The Colored Museum is an evocation of the African-American experience in truly moving tableaus.